Impulse spending is a death knell to a budget and often a precursor to mounting credit card debt. Yet it's a tough tiger to tame--on the prowl even when the economy is at its worst. In a poll of adult women for Consumer Reports' ShopSmart magazine, 60 percent of respondents revealed they had purchased something "on a whim" in the last year, including 39 percent who said they had purchased something on impulse in the last month and 15 percent who said they often bought things on impulse. Their impulse spending went well beyond the occasional purchase of a magazine stocked at the cash register: The average price of the purchases was more than $100. Review credit card use. Go through your credit card statements line by line. Which purchases were planned and in your monthly budget? What purchases did you make on the spur of the moment? Did you really need those things? Are you glad now that you bought them? A little over a third, 35 percent, of the women polled for ShopSmart magazine said they regretted an impulse purchase they made in the last year. Track your spending. Just as dieters are instructed to keep food logs to gain awareness of their eating habits, write down everything you buy to get a sense of where your money goes. You might be surprised, says the National Foundation for Credit Counseling, which suggests the exercise as a way to identify money for savings. Don't forget to include all the items you buy with credit cards--it's easy to forget purchases you charge until you get the bill the following month. Identify your weak spots. When and where are you most likely to overspend and on what items? Know where your temptations lie so you can avoid those situations when you need to abstain. Find healthy, substitute activities to make you feel good if you're self-medicating with "retail therapy." Make a spending plan. "Budget" sounds too much like "diet." Think of it instead as a spending plan. Make a realistic and complete list of all your must-have expenses, such as housing, food, rent, utilities, insurance and so on. Compare that to your income and decide, after setting some money aside for savings, how much you can afford each month for discretionary spending. The National Foundation for Credit Counseling recommends thinking in terms of cutting back instead of cutting out. You won't stick to a plan if it's too strict. Then you know whether you can afford a purchase before you put it on your credit card. Leave your credit cards at home. Take a limited amount of cash when you go window shopping at the mall so you're not tempted to overspend. 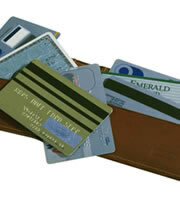 Leave your credit cards at home, except when you're planning to make a large, budgeted purchase. Credit cards don't have to spell trouble. Use them as a tool for convenience and budgeting, rather than letting them get the better of you by enabling impulse spending. 0 Responses to "5 ways to tame impulse spending"